Empowerment: advice from a pot to a kettle! 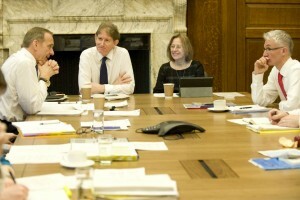 Lin (right) at the Civil Service Board meeting with (from left) John Manzoni, Robert Devereaux and Mark Lowcock. We recently published the Civil Service Leadership Statement and I know that Jeremy Heywood has been delighted at the conversation it has prompted. The three themes of inspiring, confident and empowering certainly resonate with me and are all relevant to HMRC as we look to the next round of challenges. But agreeing the relevance of a framework doesn't make it easy to deliver on, and for me (still tingling from the helpful and challenging 360-degree feedback I read last night) the 'empowering' group is definitely in my ‘future strengths’ box. Our Australian Enforcement and Compliance Director, Jennie Granger added the phrase future strengths to our vocabulary. I still recall a television programme many year ago when Professor (now Lord) Robert Winston was researching how parents help their children learn. He did a simple experiment of watching a parent and child work together on a task he'd set them. The task was to use an electronic toy to draw a house together. Each pair did the task and as a viewer we watched the process and looked at the results. The first pair produced a perfect house, square, four windows, floor and roof etc. The second pair produced a squiggle which if squinted at through closed eyes, had the early beginnings of a square shape and some windows in but without knowledge you might as easily have seen it as a strange prehistoric monster! At the time I enjoyed a moment of gender superiority, because the perfect house was drawn by dad and child (or more truthfully by dad while child watched) and the monster was all the child's work cheered on by mum. But as I've become a leader of teams, I have to challenge myself as to whether I'm more like the 'dad' character than I want to be. It's easy to justify a more interventionist style. The country needs a recognisable house, not a monster. We don't have the time to practice: I'll let them do the drawing when they're better at it. But the empowerment challenge of leadership is about fighting those tendencies and creating space for future talent to grow and develop. I know, within my team, that it's important that I give strong permission for people to wrestle the controls physically from me, as my character will revert to its more directive style. Internally, we try to allocate the normal Chief Executive roles more widely across the team, so many of our events are led by leaders from all across the organisation, formal meetings, whether ExCom or a staff dial in, are chaired by different members of the team each of whom brings different skills and approaches. However, more importantly, we're trying to look at how we design jobs and challenge ourselves as to whether and why we take decision rights too high up the chain. Ruth Owen (Director General for Personal Tax) has done some great work with all her call centre folk in our 'once and done' project, getting our frontline teams to consider and change processes. HMRC has used a continuous improvement process, which we call Pacesetter, and using those basic skills, but also empowered by the confidence that that Ruth will support them, the teams have come up with hundreds of simple and effective changes. The results are improvements for customers, efficiencies for HMRC and a great sense of value and purpose. If you want to know more, read about it here. As for me, well I'll keep striving to be less interventionist and thinking about that perfect house versus that prehistoric monster. The Leadership Statement: inspirational leaders – nature or nurture? I’m a civil servant... and I’m a Mystery Shopper! As someone employed by HMRC I have to say this is not a picture I recognise. HMRC is not an inspiring place to work at the moment. Continual job cuts, pay freezes (my pay went down last year) and a management that far from inspires seems to either criticize or condescend staff means the majority are demotivated especially when they know it's only going to get worse. As for once and done this is management effectively reinventing the wheel having previously scrapped whole case working (for which I'm sure someone got a pay award) they no introduce whole case working lit for which someone else gets a pay award. Finally "future strenghths" sounds very Sir Humphry. Couldn’t agree more Sam, HMRC is definitely not an inspiring place to work! As for empowerment, I can honestly say I was more empowered 5-10 years ago than I am permitted to be now! Until the civil service abandons the universally hated PMR system, with its associated ‘guided distribution’ (which translates to ‘quotas’ – certainly within HMRC anyway), then I doubt all those good things like empowerment, morale or engagement will ever reappear! Couldn't agree more. This is my 27th year in HMRC (and IR previously), and I can honestly say I have never felt less motivated. HMRC is an utterly demoralising place to be. Like others, I have had no pay rise for many years, and yes, my take home pay went down as well last year. Please offer voluntary exits to Band O staff and I will be first in the queue. Entirely agree, the "workers" have repeatedly said how hated PMR is, but no-one is listening or prepared to admit it is fundemntally flawed and drives the exact behaviours it professes to improve. Come on - "whole case working" is gone and it's never coming back. Move on! The Department has changed massively in the 13 years I've been here - but what doesn't change is the continual harking after a mythical "golden age" when things were better and everything was wonderful. Having read a number of communications from Lin I'm not suprised at the level of arrogance displayed here. If she worked for any other organisation or was accountable to her customers, the electorate, who have nothing but contempt for her and her organisation, she'd have been dismissed by now - not given a £20k bonus. I was a taxpayer who tried to cancel their child benefit payment, tried for 12 months despite the incompetence of HMRC, yet was branded lazy by Lin. Typical comments from our leadership Many years ago the staff had far more empowerment in how they worked and how they interacted with different business areas. We did have problems but the staff sorted them without in depth management assistance result a far happier work place and better output. I am pleased to be leaving the Department shortly as the current climate of micro management appears to be as damaging as " Health Service Reforms"
2) Work chuffing harder until the manager does see it. I could tell you that I am feeling underused in this department - I am at virtually the bottom of my pay grade since becoming an HO in 2009; my small ideas are taken up and my grand ideas are seemingly ignored; I am not challenged at all in my current grade and I have failed to score more than 1 out of 7 on any competency - and some decisions made by other people I feel I have proven are demonstrably wrong, so what do I think about inspiration and leaders and future strengths? Well either I will leave in the hope that another manager or firm will see how good I am, but until that day I will work chuffing harder proving my use and that challenge is inspiring because nothing makes you feel better than finally proving to nobody and everybody that you were good all along. 4) And finally, I remembered that life is just a ride - there are people trying to control the ride and others trying to hold on, but remember that at the end it's all just a ride. So do I need empowerment - No I don't feel like I do, but perhaps just encouragement - if you want to be empowered then just DIY - strategies are necessary and useful, but they are only strategies they are not specific answers to questions nor will they get the project completed. If you see something that you think you can do then you pick up the bricks and build that house. If your house is overlooked because someone else has built a better one then don't get uppity just get better, but don't stop as Gandhi said, "Everything you do will be insignificant, but it is very important that you do it." So to the example in the main article - if you want to get your dad to build the house for you then do that by all means, but even if you do find out what monsters others have drawn as it might just answer the question of how strong to build the walls. That ends Thought for the Day - normal service will resume now lunch break is over. This is also not a picture I recognise. I do not think HMRC is an inspiring place to work & would not recommend HMRC to anyone. Continual job cuts, pay freezes & a management that is two-faced is the norm. The PMR system is also a pet hate. It should be an enjoyable experience not one that everyone dreads when it comes along. The emphasis that is constantly being made on customer service is also very frustrating. What happened to showing some empathy for staff members? I'll give Lin credit that this is taking place at senior levels and that some of the controls are being handed over. The problem I see though is that work is standardised to such an extent that there is no room for manouver for staff on the front line. By the time we work a case we have pages and pages of instructions telling us exactly where to put the windows, and spreadsheet upon spreadsheet to complete confirming that we have put them there. This applies to things like penalties which can be subjective. Good inspectors are more than capable of making these type of decisions. The problem is the desire to measure everything, and with a reducing workforce this comes at huge cost. In compliance, the measurement should be yield. Everyone works slightly differently, but if we did trust inspectors to draw their own houses I honestly think we would see a massive increase in yield. I joined HM Customs and Excise on 6 May 1997 so will have been in HMRC - or its antecedents - for 18 years so have a good bit of history on this like others. I have to say I am hugely proud of our past but I don't quite remember it is as the halcyon days others do! In those 18 years what I have seen countless times and learnt as an article of faith is that if you want to deliver to your best you must listen to, trust in and act on what your frontline says because they know customers, what they do and how they behave - empowerment. Of course empowerment on the scale of HMRC - 60,000 people, 45m individual customers, etc, etc - or any Government department is an never-ending challenge but it does create sustainable excellence because it is based on the best evidence insight we have. However, when HMRC is at best - which is a lot of the time - I recognise what Lin describes and what is exciting at the moment in HMRC is the challenge to replicate that best across everything we do which on the scale we operate, while maintaining the revenues that fund our public services is a huge challenge. The real challenge here - which is for all of government not just HMRC - is the tension between empowering our people while maintaining our business delivery. Final point. I joined HM Customs and Excise because I believed in public service because it is about giving back to the country that gave me opportunities, to help build the community in which I live and build the society I bring up my children in. I still believe in that 18 years later, still believe HMRC does that so am still inspired by HMRC. To borrow from the analogy, we can only build our houses in HMRC if they follow a suffocatingly prescriptive design, there's little point or motivation for employees to do otherwise. The CEO's current style & actions are not going to lift engagement much. Motivated employees are not the norm, yes people put on a show if Lin is visiting etc but the draconian appraisal system alnd effective pay cuts have taken their toll. It can be reversed. What about a leadership style which leads without hectoring, dismissing and suppressing alternative views? Its management by stick, with the odd mouldy carrot thrown onto the filthy office carpet for the few. How can once and done work when the vast majority of us have become jack of all trades,master of none, and how can staff morale ever be high when all we have become are stats on a spreadsheet?.I am glad that I am nearly 37 years down the road, I would hate to be a new starter now. I can count the leaders I have had the pleasure to work with on one hand. Sadly I have lost count of micro managers - In school they call it bullying, in work they call it management by statistics and performance indicators. If you want an empowered work force stop beating us with a big stick and stop shqackling us to meaningless process and let us get on with what we do well. Give us space to be proactive, reflective and progressive that will create a happier work force. And on the next pay round can the 48% on the max get a consolidated pay rise I don't care if it is only 1% that would be an improvement. Yes, it's a lovely theoretical aim. If only it was being put into practice in HMRC, and, I'm sure, other departments. Unfortunately, here, the etch a sketch comes with 50 pages of standard working instructions that must be followed each time. Then a raft of checking systems where any deviation from those instructions results in a penalty of some kind. So, innovation is not allowed, imagination is frowned upon, initiative is punished. All at a time when we are being asked to think outside the box, the over-riding message is Get back inside that box. How does Lin's "gender superiority" reference align with the Civil Service Diversity and Equality Policy and the requirement for managers to avoid stereotyping? I think Lin's 'gender superiority' comment was tongue in cheek, if we took everything we read or do literally the world would be such a miserable place. Really struggling to make the system actually work - find courses etc. This site is NOT user friendly.